I never get sick. I have a killer immune system. Usually, the common cold and the annual flu pass me by but this last year I wasn’t so fortunate. 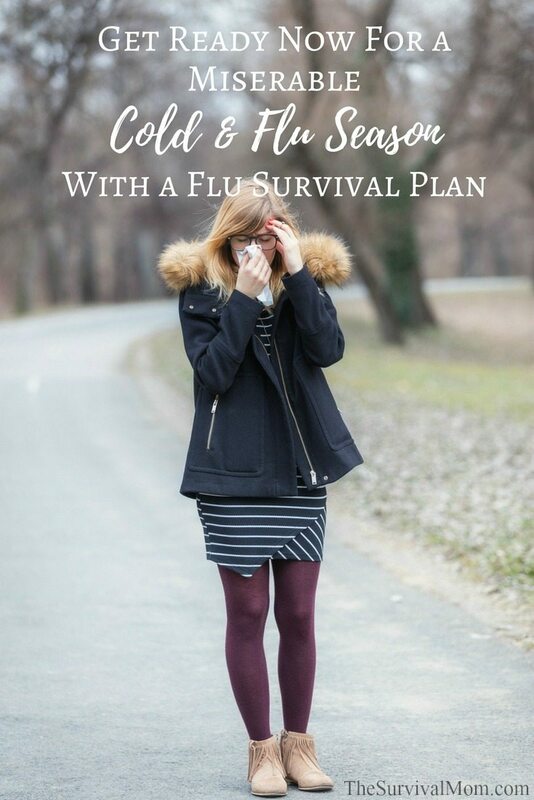 With no flu survival plan in place, The flu hit me hard and I was knocked off my feet for more than 2 weeks. 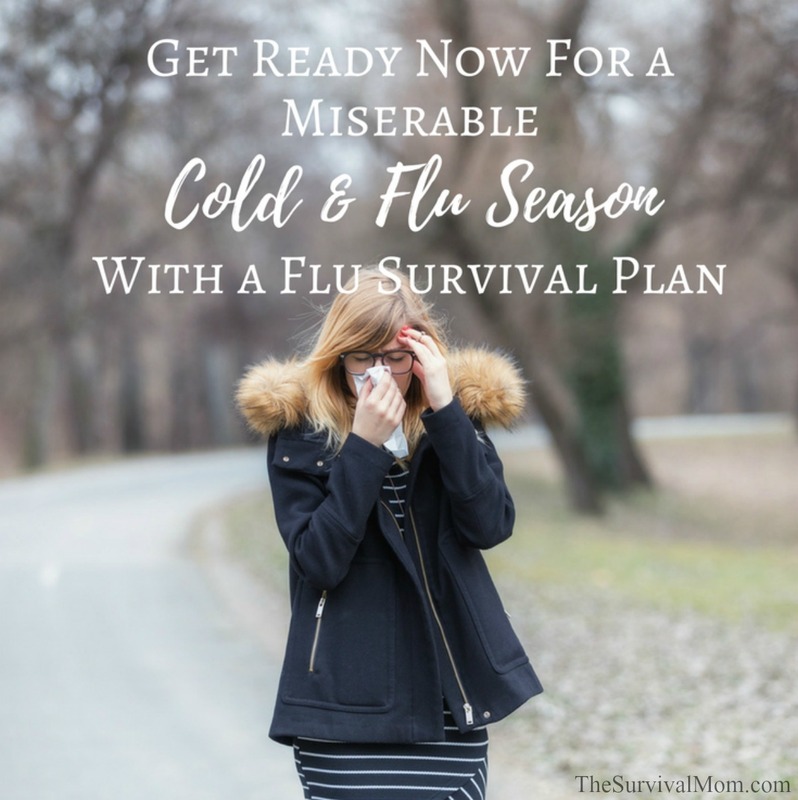 At one point, my fever was high enough that I was delirious, giving my husband crazy instructions for plugging in a heating pad, as my whole body was wracked with violent shivering. What was funny is that I knew what I was saying made no sense, I knew I was delirious, and I still kept talking crazy talk. Thank God my husband has a good sense of humor! I knew I had a case of the flu when my symptoms became very extreme, very quickly, although for some people, symptoms of the cold can be confused with those of the flu. It’s easy to confuse symptoms of the common cold with the flu, but in general, flu symptoms are simply worse. The flu comes with a fever, severe body aches, a deep cough, violent chills, severe fatigue — truly miserable symptoms. A cold isn’t a whole lot of fun, either, but those symptoms will be milder — runny nose, sore throat, plenty of sneezing, body aches, and mild fatigue. Once symptoms cross the line from feeling “under the weather”, to “just kill me now”, you probably have the flu. Before you’re faced with a sick family and have no choice but to make a mad dash to the drugstore, you’ll want to stock up on a few items to make the best of sick days. 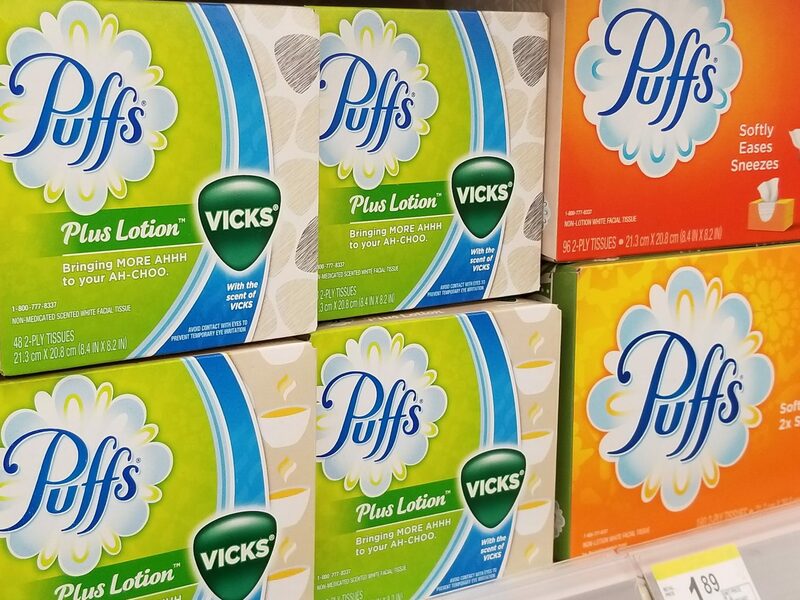 At the top of my shopping list is Puffs with Vicks (I love getting a nice, deep breath of eucalyptus from the Vicks), DayQuil, and NyQuil. I also keep lozenges on hand, Vitamin C (chewable for kids), a heating pad, ibuprofen, and acetaminophen. NOTE: Starting 10/29, Walmart shoppers can save up to $5 on medicine cabinet essentials just in time for cold and flu season. 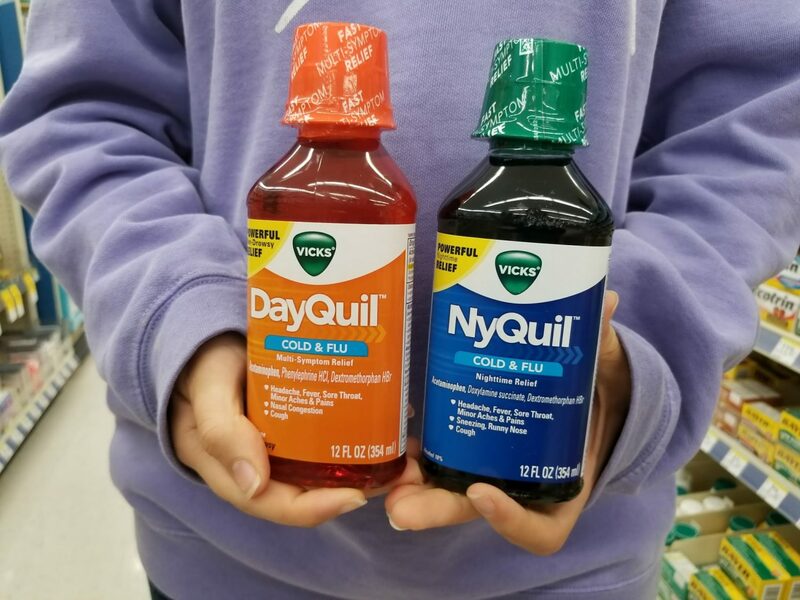 On this date, look in the P&G brandSAVER in your local Sunday newspaper or at PGeveryday.com to find coupons for $0.50 off Puffs and $1-$3 off Vicks products including DayQuil, NyQuil, Sinex and VapoRub. This arsenal of cold and flu symptom relievers will help your family feel better this season. I’ve also found that sippy cups (yes, even for older kids and adults) are helpful for always having liquids at hand while avoiding all-too-frequent spills. A case of Gatorade or Pedialyte will provide liquids, along with electrolytes potassium, magnesium, and sodium. You can also make a batch of homemade rehydrating liquid using the recipe in this article. Once a family member has been diagnosed with the flu, in particular, it’s time to set up a “sick room” with all these supplies handy. On the bedside table, have Puffs with Vicks (again, one of my favorites), a spill-proof cup filled with water, Gatorade, or something similar and a trash can to hold used tissues. A high fever will require extra blankets, a heating pad, or a hot water bottle, so have those handy as well. Limit the amount of time well family members spend in the sick room. If there’s anything worse than a full-blown case of the flu, it’s everyone in the family sick with the flu! For sure, you’ll want to limit this cold or flu to the poor victim who is down for the count. To stop the virus from spreading, require family members to wash their hands frequently — create a checklist for the kids and have them record with a sticker or a check mark every time they wash their hands during the day. Make sure everyone knows how to sneeze properly, covering their sneeze with either a tissue or sneeze into the inside of their elbow. And, when you leave the sick room, be sure to wash your own hands with soap and water. You should also have some warming comfort food, like chicken soup, or broth. I would include having mucinex, sambucol, eucalyptus oil for diffuser, zinc, vitamin c, and chicken noodle soup to make a complete care package. I now get a flu shot every year. For awhile, I would tough it out and by February, just in time for my birthday, I would celebrate with a good case of flu! I am also getting better at constantly washing my hands in winter. I think that the door knobs, car doors, etc attract flu bugs. I like to go “au naturel”! I make my own elderberry syrup and echinacea tincture each year. Also, I make a honey/lemon/ginger elixer to mix with hot water when I feel a cold or sore throat coming on. Those and I make a pot of chicken soup to freeze in single serving containers. When I get sick, or feel it coming on, I take out a couple of servings to thaw in the fridge. I don’t add noodles until I heat the soup up so the noodles don’t get overly soggy! I also put in a stash of tissues and essential oils needed for my diffuser. Another thing I do to help is take my favorite hand lotion and add tea tree oil to it. Helps keep my hands and feet moisturized and on the hands, it is anti-bacterial as well as anti-fungal. One last thing that I like to do is open the ends of the current box of tissues and add a combination of essential oils: eucalyptus, peppermint and tea tree oil just to the box ends (a couple of drops of each on both ends of the box and the oils diffuse into the tissues. That way, when I am stuffed up a bit, the tissues help to open the sinuses. I use the same combination of oils on a couple of cotton balls in a small jar and keep it next to my bedside for those times that I wake up stuffy – I open the jar and sniff away! Lea, those ideas sound fantastic. I’m wondering if you would share the elderberry and echinacea tincture and also the honey/ lemon/ginger elixer recipes on this site in the replies as I for one would love to be able to make them. I have a follow up article that delves into natural remedies. Thanks for your suggestions! Lea, thanks for all of the great ideas. I, too, prefer organic homemade to store bought OTC meds. I make a Fire Cider to help prevent any flu/cold issues, and also have made my own elderberry syrup. The ideas for the tissues and the cotton balls are brilliant and simple! I prefer my current approach of consuming sufficient vitamin D3 and MK-7 to make my immune system the best it can be while preventing osteoporosis and arteriosclerosis. The most important book in my health library is Vitamin K2 and the Calcium Paradox: How a Little-Known Vitamin Could Save Your Life by Kate Rheaume-Bleue. Good post, but might I suggest one thing? How about preventive action at the very moment of feeling ill? Found this stuff and for me it has been incredible. Any time I feel like a cold or flu may be starting I take this, works every time. It’s called Recover.